BEAVERTON, Oregon — Some places, it turns out, are just like home. Although FC Barcelona’s Wednesday workouts took place some 9,000km (5,600 miles) from the friendly confines of the Ciutat Esportiva, it didn’t feel much different from an ordinary day of preseason practices. 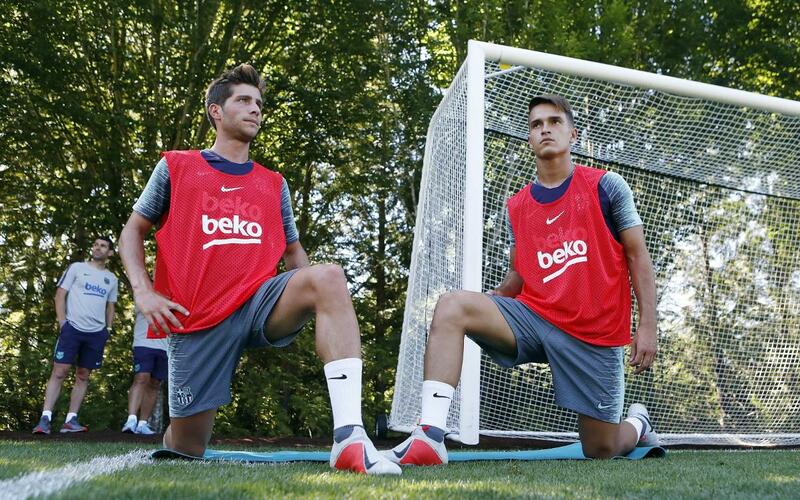 That’s because here, at Nike’s expansive, 400-acre (160 hectare) campus, everything was geared towards the visiting Catalans as they held their first training sessions of the 2018 US Tour. Barça logos were everywhere — on building entrances, golf carts used to shuttle the players around the campus, and even painted on the grass adjacent to Barça’s training field. The field itself was watered generously by sprinkler, just they way the Barça players like it, minutes before taking the field. For the morning session, along the sidelines, scores of Barça fans from all over the Unites States — and the world — lined up to catch the first 15 minutes of Wednesday’s session. By 10.00am PST, when the workout commenced, the temperature was already close to 80 degrees Fahrenheit (27º C) — and rising steadily. The long-proven training session favorite — the warmup exercise known as The Rondo — delighted all in attendance. Beads of sweat quickly formed on the players foreheads. A total of 13 first-team players and another baker’s dozen of Barça B players took part. Rafinha and Paco Alcácer worked out individually on the side. Ernesto Valverde and his players were then back out on the same field later, at 7.00pm PST, for the day’s second session. The team will train at Nike again on Thursday morning at 10.00am local time.